Let Warner Connect deliver the performance and reliability you need to serve and manage your online applications. From basic web and email hosting to large, mission-critical application hosting projects, we have the experience and technology to deliver high-end solutions with specific benefits for small to medium sized businesses. We have a complete network infrastructure that is designed to work with a wide range of technologies to deliver the solutions our customers need. Your business isn’t pre-packaged—your hosting shouldn’t be either. We’re more than just a “hosting company”. 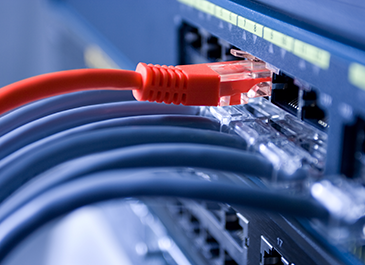 We provide a whole range of connectivity options designed for smaller businesses. So as you grow, we’ll be there every step of the way to help you stay ahead of the competition—adding virtualization, remote systems management, and other IT infrastructure and software solutions as you need them. It’s a whole new way to think about hosting, and it’s a smarter way of doing business. Our sophisticated Internet connectivity solutions deliver secure, reliable high speed access for organizations. We deliver a range of services through a variety of bandwidth medium, depending on customer requirements. Internet access is right-sized and designed for businesses that desire a straightforward approach. Private connectivity allows for a convergence of Internet, voice, and shared hosted service, which is both flexible and cost effective. When coupled with our voice services, you get a powerful and affordable single source connecting you to the world. With the power of always-on high-speed connectivity, you can take advantage of new technologies like application hosting, remote systems management and a wide range of infrastructure services available from Warner Connect. We can customize a dedicated data services solution that fits your needs—from email and website hosting to server virtualization; it all starts with the connection. Warner Connect provides everything a company or IT department needs for small business IT services, managed services, IT consulting, cyber security, network services, and voice services.